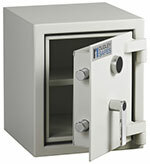 The Dudley is a tried and tested range of safes, installed in thousands of UK high street retailers and Plc's. Recommended by the major UK insurers. The safe benefits from both a high grade locking mechanism as well as a 50mm body to deter even the most determined thief. Enhanced 50mm body construction with drill and fire resistance properties. Reinforced steel plate door with added drill and fire resistance. A heat activated door seal is fitted offering further fire protection qualitites. The door is locked using a high quality 7 lever lock. Enhanced 50mm body construction with drill and fire resistance fitted with re-inforced solid steel door plate. The boltwork is secured by a high security double bitted keylock as standard.